On a day when the clouds refused to yield at Torrey Pines, Billy Horschel’s white golf ball dropped out of a gray sky and nearly into the cup on the South Course’s par-3 8th hole Tuesday. His reward for near perfection after he walked to the green? He got to pick the ball up and go to work. A ball had been dropped in each bunker by his caddie and two more were hiding in the lush greenside rough, buried deeply like eggs left by an evil Easter Bunny. Five balls in all and Horschel’s job was to drop each within 6 feet of the tournament’s four locations, three indicated by wooden pegs in the green. Horschel worked through the shots, the toughest being a ball in the back bunker to a back pin, a tight shot to execute with about 5 feet of green to the hole. 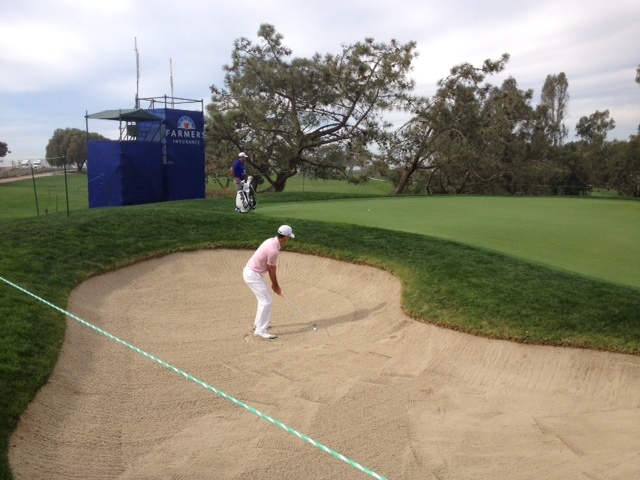 Horschel’s sand shot floated out softly but didn’t land within the desired distance. Do it again, his caddy, Micah Fugitt, directed him. “Oh, man, that was perfect,” Horschel said in a bit of mock protest. And then he hit another one that passed the test. Hole after hole, this is how Horschel’s practice round went until he walked off the 18th green at about 2 p.m. Tuesday afternoon. This was a PGA Tour pro at work on tournament week. If you follow the PGA Tour, you might remember Horschel for the octopus pants he wore for a round at the U.S. Open. Locally, you’re possibly more likely to recall that he was in the final group of last year’s Farmers Insurance Open. Playing alongside eventual, and seemingly perpetual at Torrey, tournament champion Tiger Woods, Horschel couldn’t follow up his strong start and finished T-39. Horschel, dressed in a pink shirt, white PING hat and white pats, was working hard Tuesday to prepare himself to better last year’s finish at a tournament that was his breakout a year ago. “I still have good vibes about the place, for sure,” Horschel said. “There’s a learning curve out here and that was a learning experience. To better his best finish at Torrey, Horschel spent his practice time Tuesday with a heavy emphasis on the short game, but with no neglect of anything. His overall game certainly seemed sharp. He followed his near ace on No. 8 by bouncing his pitch shot into the pin on the par-5 No. 9 for a near eagle. The reward? Two more pitches to alternative pin locations and more work on the green – by Billy and his caddie. While Horschel worked, Fugitt hand-rolled multiple balls to one peg and studied the break. Two holes later, Fugitt switched to being videographer. 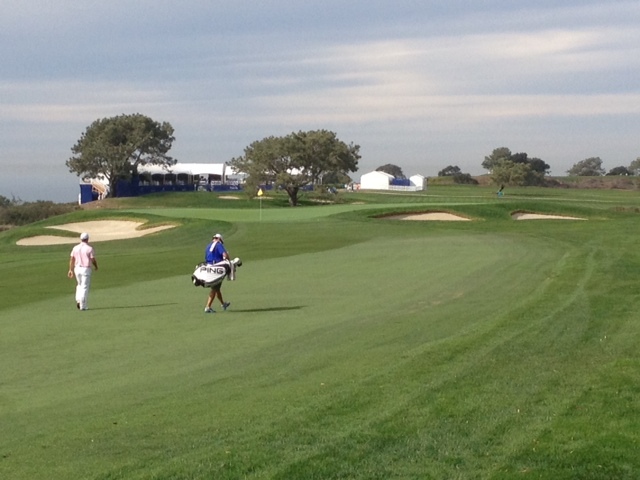 On the long par-3 11th, as Horschel teed off with an iron, Fugitt stood behind him taking video with a cell phone camera. Horschel’s shot came up short right of the front pin location. Horschel studied the video for about 45 seconds and re-teed. Similar result. “Too high,” Horschel self-analyzed as he walked off the tee. At the green, the short-game game began all over again with him hitting chips, bunker shots and putts to various locations. His caddie confirmed and Horschel dropped more balls. On 12, the tough par-4 played toward the ocean, Horschel spent more time testing the Torrey rough, which was ankle-deep and thick. After Horschel’s club hit the rough with a grassy thud his swings produced divots the size of small house plants. He hit four or five more from that spot. The desired short-game goal always seemed to be six feet, but Horschel wouldn’t be that specific when asked later. “The closer you get to the hole, the better your chance on the putt,” he said. “If you average getting it within 6 feet on your short-game shots, you’ve got a pretty good chance of getting up and down. On 13, a par-5 played with two split tee boxes, Horschel found the middle of the fairway with his drive and then tried to get home in two to a green fronted by tiered bunkers. His first attempt slammed into the wall of the front left bunker; his next did the same on the right. After taking a minute to recalibrate, Horschel fired a 3-wood that cleared easily and bounded onto the green. “That was a solid,” Horschel said while handing his club to Fugitt. It was the closest he came to an audible self-compliment all day. After he walked off the 18th green, I asked about his practice routine and the amount of time, especially, he spent playing out of the rough. “The rough is thick. You know you’re going to miss some greens, unfortunately, so I needed to find out how the ball was going to react. Getting up-and-down can save you a lot of shots,” he said. Starting Thursday, we’ll find out if Horschel’s practice saves him enough. 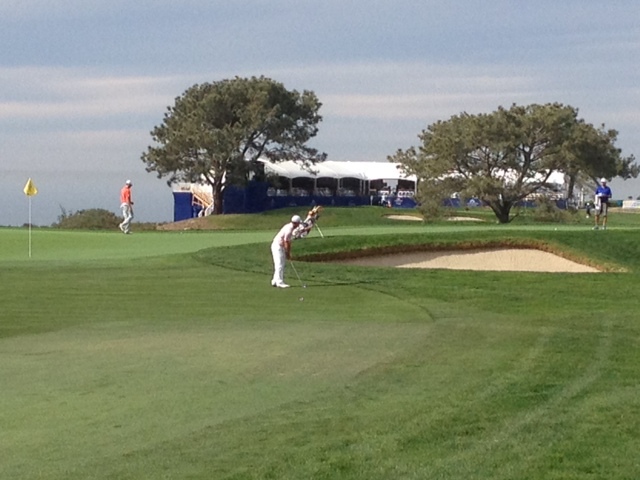 This entry was tagged Billy Horschel, Farmers Insurance Open, Micah Fugitt, PGA Tour, PING, South Course, Torrey Pines. Bookmark the permalink.